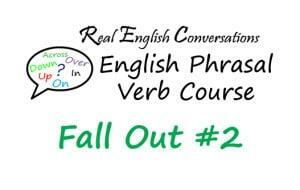 Learn the meaning of English phrasal verb: Fall Out. This phrasal verb has 2 different meanings but this lesson focuses on a problem in a relationship, a fight or a quarrel. Here are the examples that were used in the audio. Below, you will find 2 additional examples to help you understand how to use this phrasal verb in context. The kids have fallen out and are no longer speaking to one another. The kids had a fight and are no longer speaking to one another. I never want to fall out with you because we are best friends. I never want to have a fight with you and never speak again because we are best friends. My mom had a falling out with her step-sister and they can’t be together in the same room anymore. When I found out my friend was saying bad things about me, I confronted her and we had a falling out. Get access to full lessons from the Phrasal Verb Course with lessons you can print, download the audio and get the Phrasal Verb Stories to hear all the phrasal verb lessons being used together!